A brief history, scientific facts and current political news stories about the great American Bison. 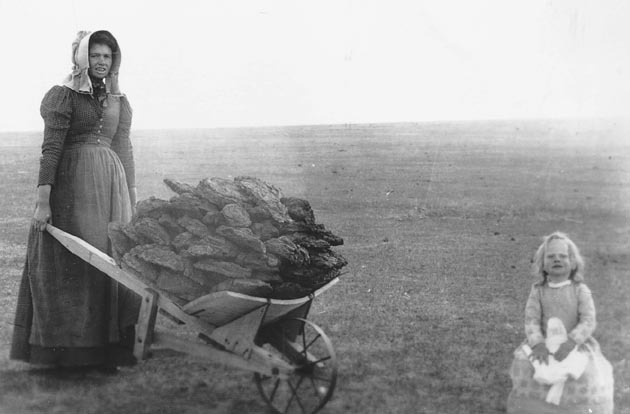 A common chore for western pioneer families. When wood was scarce, bison dung was an effective campfire fuel. Bison once roamed from Canada to Mexico, grazing the great plains and frequenting the mountain areas of the North American continent. Their number being so great that the early explorers could not count them, describing them as "number-numberless," and "the country was one black robe" and the "plains were black and appeared as if in motion" with the herds of bison. The most commonly used estimate of their former numbers is approximately 60 million. A strong relationship between the human and the bison has existed for thousand of years. Bison were the center of life for the Plains Tribes of Native Americans, providing them with food, shelter, clothing and spiritual inspiration. Legend tells "the Great Spirit brought the pipe to the people. She came as a young woman wearing a white buckskin dress and moccasins. After the Great Spirit presented the pipe to the people and explained the significance of that pipe, she left the teepee as a white bison calf." The near extermination of the American Bison did not occur just in a few short violent years. The fur trade, which began in the 1600s, initially focused on beaver but then demanded that bison (buffalo) robes be shipped to Europe. By the early 1800s, trade in buffalo robes and buffalo tongues significantly increased and caused approximately 200,000 bison kills annually on the plains. The 1830s to 1860s were the four decades in which most of the slaughter of bison occurred. Wagon load after wagon load of robes, tongues and, occasionally, selected cuts of bison meat, moved east. Soon, collection and shipping of bison bones to eastern cities where they ground up for use as phosphorous fertilizer or bone char became common. The arrival of the railroads further exacerbated herd conditions for the bison and by the early 1880s there were only a few free-ranging bison. In 1886, zoologist William T. Hornaday needed specimens of the plains bison for the National Museum in Washington, D.C. Knowing that the plains bison were now becoming quite scarce, he went west and collected in eight weeks time only 25 bison in a region (Montana) that had supported tens of thousands a few years earlier. His thorough search clearly demonstrated that the species was indeed in danger of imminent extinction. By 1893, the estimates were only slightly more than 300 bison left of the herds that conservatively numbered near 60 million animals. On December 8, 1905, the American Bison Society was formed with William Hornaday as president and Theodore Roosevelt as honorary president. Roosevelt persuaded Congress to establish a number of wildlife preserves, and, with the help of a cadre of private bison owners, the Society was able to stock a number of preserves and parks. A 1929 inventory of bison counted 3,385 animals, and although the count was not precise it was encouraging enough that the Society discontinued its programs and activities in 1930. Ranchers and breeders recognizing the obvious economic potential of the animal, expanded their efforts to preserve, protect and reestablish the American Bison. The National Bison Association (NBA) estimates approximately 150,000 bison in public and private herds in the United States at this time. Of these animals the federal government manages approximately 6,000 and tribal authorities at least 5,000. A small number of bison are managed by city and state governments but 90% are owned and managed by private sector entrepreneurs. Herd numbers can range from one to several thousand. The largest public herd is in Yellowstone National Park (approximately 4,500), and the three largest private herds are those owned by the Houck family of Pierre, South Dakota, Turner Enterprises and Durham Ranches, Inc.
Over the years the presence of the American Bison had deeply affected the peoples of this continent in a way that no other species, present or past, has been capable of doing. This heroic and magnificent beast is not only an inseparable part of America's past, its future place in American history now also appears secure. The bison, more so than any other animal or bird, is a unique symbol of the strength and determination of the people of North America. 4701 Marion St., Ste. 100, Denver, CO 80216 - Ph:(303) 292-2833. The American Buffalo is not a true buffalo. Its closest relative is the European Bison or Wisent and the Canadian Woods Bison, not the buffalo of Asia or Africa, such as the Cape Buffalo or Water Buffalo. Scientifically, the American Buffalo is named Bison and belongs to Bovidae family of mammals, as do domestic cattle. Because our history has so ingrained in us the name "Buffalo", we still use it, although "Bison" and "Buffalo" are used interchangeably. Yellowstone's bison are being slaughtered by the Montana Department of Livestock out of fear that a disease (brucellosis) some of them carry may pose a threat to Montana's cattle industry. The truth, however, is that there is no evidence that wild bison have ever transmitted disease to domestic cattle. It is a complex and difficult matter that has yet to be resolved.